The Museum of Indian Culture, Pennsylvania’s oldest Native American museum, is a unique resource center for people of all ages to learn about the Lenape (Delaware) and other American Indian tribes. 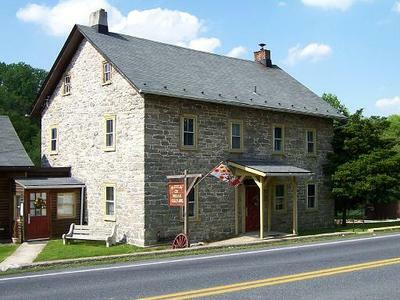 Located in an eighteenth century stone farmhouse in the scenic Little Lehigh Parkway, the Museum has educated the community about Native American heritage for over 30 years. Each year, the Museum provides guided tours of hands-on exhibits showcasing Native American tools, basketry, artwork, photographs, textiles, and beadwork. Visitors learn to grind corn using a mortar and pestle, make a fire with a softwood fire kit, and even try their hand at the ancient American Indian hunting implement, the atlatl. A full-size bark wigwam, stretching rack, and corn grinder on the Museum’s grounds give visitors a taste of a real Eastern Woodland Indian village. The Museum also offers a comprehensive research library and educational outreach programs for school and community organizations throughout the region. Finally, the Museum hosts several annual festivals celebrating Native American dance, music, art, and heritage, including the Roasting Ears of Corn Festival during the third weekend in August, a children’s craft event called Native American Heritage Day in May, a community cultural heritage festival called Artifest in June, an Open House in November, and other special events, craft workshops, and lectures throughout the year. For more information about tours and special events, please visit the Museum’s website and Facebook page or visit the Museum during regular hours on Fridays, Saturdays, and Sundays from 12-4 p.m. This place is great! No quasi-spiritual babble, a great place to explore and learn about history and Native American culture.The Staff is friendly and knowledgeable. We took a walk on the grounds after our tour. The park is well-kept and clean. The Museum is a must see! Thank you so much for letting us know about the Museum of Indian Culture in Allentown, PA. I had no idea it existed and I'd just love to take a tour, it would be so interesting and educational.